My name is Enzo Aiello. I am a mosaic artist and I live in Rome. 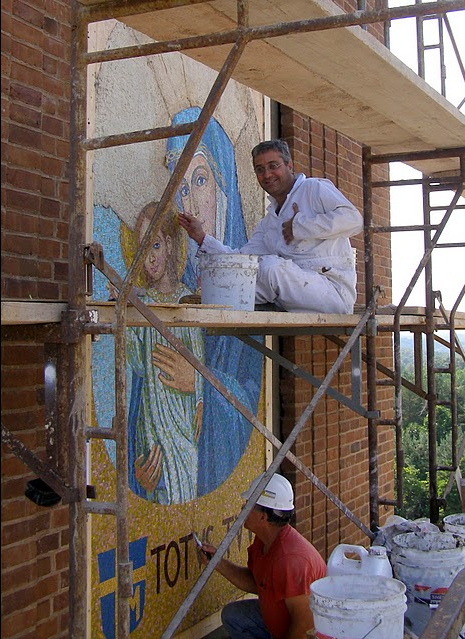 Since1990, when I was apprenticed to the Vatican Mosaic Studio, I have been focused on the creation of new mosaics aswell as the restoration of ancient mosaics. I consider myself lucky to have been born in Italy – a place where, according to UNESCO, 60-70% of the world’s artworks reside. This fact makes my country unique in the world and recognizes its inarguable place in the visual arts. There were four memorable moments that led me to pursue the life of an artist. First, I grew up in Calabria, (the southern part of Italy), in Vibo Valentia, a city rich in Roman and Greek archeological sites. During my last year in high school, I visited the archeological museum in Reggio Calabria where I saw I Bronzi di Riace, the Greek bronze statues recently discovered after they were lost on a ship wreck 2,500 years ago. These statues were probably made by Fidia (Phidias), the Greek sculptor responsible for many of the sculptures in the Parthenon in Athens. This view effected me because the two statues represent the perfect aesthetic greek canon. Shortly thereafter I moved to Rome to study art and painting at the Fine Art College.The second moment occurred when my uncle took me to see the Fori Imperiali (Roman Forum) near the Colosseum in Rome. There, on a wall along Via dei Fori, are geographical maps made of marble and bronze. These are not ancient, but rather from the era of Mussolini. The maps show the Roman Empire during its many phases of growth, and upon seeing them I was filled with emotion. Later, at the Vatican Museums I discovered Raffaello (Raphael), and in particular his masterpiece The Transfiguration. Upon viewing this, I was left without words to describe my reaction to this beautiful vision.It did further my in my endeavors to become an artist in some way .And finally, at the Galleria Nazionale de Arte Moderna, I happened to see the painting Il Sole by Giuseppe Pellizza da Volpedo, an Italian pointillist. Previously, I had seen this image in art history books, but to see it in person was amazing, stunning. As you can see, I grew up in an environment so rich in art and culture that I could not escape being affected by the strong tradition of aesthetics, and the refinement and desire for details. In fact, these same philosophies and attitudes stimulated my thoughts, fed my soul, shaped my personality, and brought me to the conclusion that becoming an artist would make me a better man. The weight of history, tradition and absolute, perfect aesthetics can be very heavy upon the shoulders of a young artist. Living day-to-day amongst the masterpieces of history, one’s eyes can become used to such an esteemed level of expected perfection that a young artist can become frustrated, if not paralyzed, in his attempts to attain that level of perfection in his own work. As a young man, I did not understand that the unspoken expectations of the masters are not obstacles and walls, impossible to scale and overcome, but rather, challenges that would, through time and experience, lead to alternative ways to uniquely express myself without denying my artistic heritage. I was in this frame of mind when I was offered the great chance of my lifetime: I was asked to become an apprentice at the Vatican Mosaic Studio.